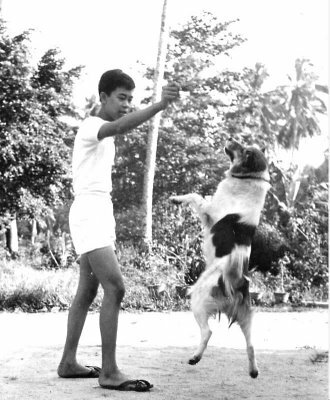 Most households in our kampong kept dogs, and we were no exception. Our first dog was a brown coloured mutt by the name of Ah Wong. 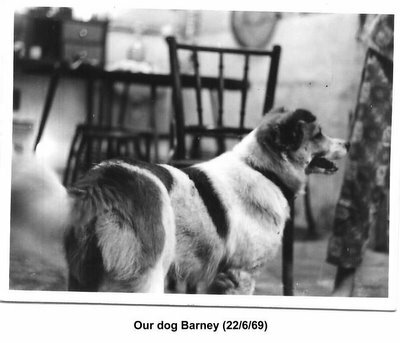 I was too young to remember much about this dog, but I recall seeing him swim across the fish pond once. 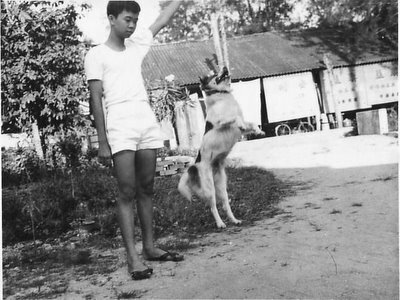 According to my father and older siblings, Ah Wong was a ‘champion’ fighter. Those days, dogs got into fierce fights during the mating season. 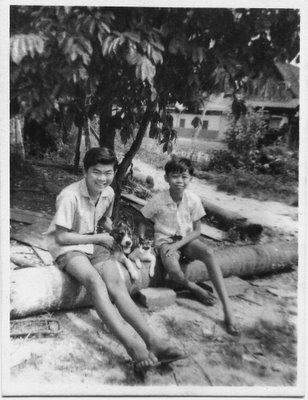 After that we had three dogs by the names of Puteh, Hitam and David (pronounced ‘Debit’). No prize for guessing the colours of the first two. The third was light brown in colour and had a short tail. How it got such a short tail is too gruesome to describe in this blog. I also mentioned earlier that we had a neighbour by the name of Tao Kua (bean curd) Kuan, who reared pigs and let them roam about. Often his pigs came to our compound and deposited their dung all over. So whenever we kids see the pigs, we would hurl stones at them and shout and chase after them; at the same time setting our 3 dogs at them by shouting’ “Oosh! kar kar!”. Unfortunately, I do not have any photos of these 3 dogs. At that time, we did not have a camera. Or perhaps our films were too expensive to be ‘wasted’ on animals. I think Hitam died from wounds sustained in one of the dog fights. But Puteh and David died of old age. In fact my elder sister, Pat still remembers vividly how Puteh died. One morning, it was drizzling slightly when it just fell into a shallow drain around our kampong house and never got up again. Later when we removed its body to bury, it left a dry patch on the drain. Our next dog was called Nappie. We named him after the hero of a popular spy movie/tv series called, The Man From UNCLE. The hero, Napoleon Solo was played by Rober Vaughn. His sidekick was a Russian by the name of Illya Kuriakin or something like that. He was played by a handsome blonde British actor, David McCallum. Like Orlando Bloom, this chap was very popular with the girls. A photo of me and Nappie taken in 1967. Handsome isn't he - the dog, I mean. The car behind us in my 7th Uncle’s first Toyota Corolla. I remember vividly how Nappie died. In fact I can tell you the exact spot where he was knocked down by a car in front of the bus stop in Lorong Chuan. One morning he followed me and my brother out to the main road and in spite of our repeated attempts to chase him back, refused to return home. Thankfully, it was not very bloody. I think the car hit his head and there was only a bit of blood from his mouth. I can’t remember if any of us cried. Maybe my sister. Me and my brother James forcing Nappie to pose with our cat Mimi, another interesting pet. I will blog about her when the Year of The Cat comes around. We are seated on a coconut tree trunk. Behind us is a soursop tree – very fruitful. Sometimes the fruits were so huge our whole family cannot finish. I often make soursop syrup with it. One problem with Singapore men is that, once they start reminiscing about their ‘army daze’, they simply cannot stop. 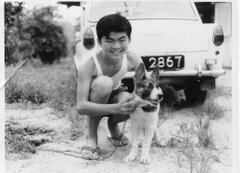 So, I have to put my blogs about kampong life on hold and continue with more stories of my NS (National Service) days in the army. This time, I want to blog about my time in the School of Combat Engineer in Gillman Camp in 1977. If you travel southwards along Alexandra Road, as you approach Keppel Road, you will pass a place called Gillman Village on your left. Inside this huge undulating compound, you will find an assortment of enterprises such as a food court, restaurants, furniture store, offices, and others. Do you know that this place is quite rich in history? It was originally a British military camp. 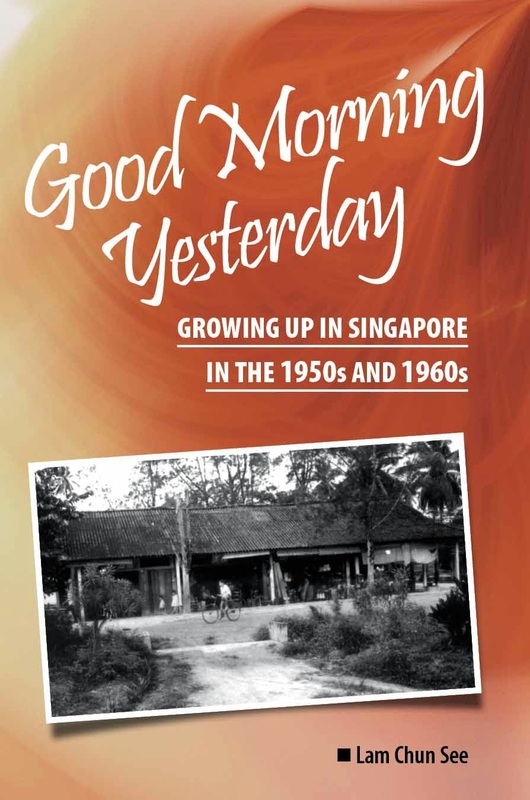 It was then called Gillman Barracks. I believe it was named after Major General Webb Gillman, who was appointed in 1927 by the Army Council to prepare a detail scheme of defence for Singapore. During the 2nd World War, this area was the scene of some fierce fighting between the British Loyal Regiment and our local Malay Regiment on one side, and the invading Japanese army on the other. You can read two personal accounts of the fighting that took place at Gillman at the two websites listed at the end of this article. Following the withdrawal of the British forces from Singapore in 1971, Gillman Barracks was renamed Gillman Camp when the SAF (Singapore Armed Forces) took over. It subsequently became the headquarters of the Singapore Combat Engineers (HQSCE) and also housed the School of Combat Engineers (SOCE) as well as a couple of other Engineer units. It was during this period that I spent one of the toughest stints of my NS (National Service) days. I want to share with you my memories of those days. Recently, I visited the Gillman Village where I had lunch and walked around taking in the changes. The place has changed drastically from what it was like in 1977 when I spent four-and-a-half months undergoing the Junior Officers Engineer Course (JOE Course) at the School of Combat Engineers (SOCE). Sadly, I could not even identify some of the landmarks like the Commanders Training Wing, the swimming pool or the syndicate rooms where we bunked. The only clearly identifiable building was the Officers’ Mess (photo below) which is now occupied by the Gillman Food Centre. After I completed my 9 months of Officers Cadet Training in Safti, I never expected to be sent for yet another course. This was because I had earlier completed 6 months of BMT (Basic Military Training) and Section Leaders training before I was disrupted to pursue my university studies. My disappointment turned to dismay when I found out that I was posted to SOCE for the Junior Officers Engineers Course or JOE course for short. 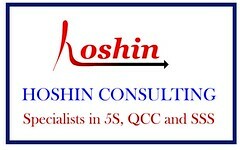 I had heard that this course was a very tough course and many trainees even suffered slipped discs during the training. Furthermore, it was not unprecedented for temporary 2nd lieutenants to be demoted to sergeants when they failed the course. As it turned out, our fears were not unfounded. The JOE course was made up one tough exercise after another, all crammed into a short space of 4½ months. Not only were the exercises physically demanding, the theory exams were also killers. The mine warfare, field fortification, demolition, bridging and other course manuals (or what the army calls ‘format’) were inches thick. I remember waking up once at 4+ am in the morning to cram for my written tests. It was probably more than a coincidence that most of my course mates were either Engineering degree or diploma holders; except for the regulars. We even had 2 guys with Phds in civil engineering; one specializing in Bridges (David Chew) and another in Soil Engineering (Dr Fwa) – 2 really nice and humble gentlemen, if I may add. I often had this suspicion that some NCO sitting comfortably in CMPB (maybe someone like my friend Victor) picked us by looking at our paper qualifications. Anyone with the letters “Eng” after their names automatically qualified for Combat Engineers training. Alas we also found out that Combat Engineers was just a nice name for hard labourers. One of the toughest exercises we went through was Exercise Lotus, where we had to construct a 9-span triple-triple Bailey Bridge. The Bailey Bridge is actually a 2nd World War bridge which you can find in parts of rural Malaysia even today. We were so happy that the bridge was finally completed and our ever so tough and demanding course commander, Lta Soh Guan Kwee actually complimented us on a job well-done. I suspect he did not expect this bunch of ‘neng-kar-pengs’ (‘soft-legged soldiers’ in Hokkien) to complete the bridge to the last detail and in record time too. Our joy was short-lived because, after a short rest, we had to dismantle the bridge and clean and keep the stores. Apparently, dismantling the damn thing was just as tough, if not tougher than assembling it! At the end of Exercise Lotus, even though it was a Saturday afternoon, when every true-blooded NS boy would rush to book out of camp, most of us simply spent the afternoon sleeping in our bunks returning home only in the night. Never before had my poor back felt so sore. Subsequently, when we became platoon commanders and had to push our men to carry out a similar exercise, we were thankful to Lta Soh (nicknamed, the Pork Seller) for pushing us so hard to complete the Bailey Bridge. This guy was so tough that he actually made us repeat one exercise on mine warfare just to proof that he didn’t make empty threats. In case you are wondering, it is no joke to redo a major exercise because it involved lots of rescheduling and logistical arrangements. Thanks to the man, we lost one precious weekend to repeat Exercise Hedgehog (or Porcupine, or some other fanciful name that these people dreamed up). By the way, his motto was: Skill in Doing comes from Doing. In fact, at the end of our course, some wise guy left a note on the door of our bunk for the next batch of JOE Course trainees. Basically, he did some simple mathematics to warn them that for the Ex Lotus, each one of them should be prepared to lift a total of X number of tons. He did this by adding the total number of panels or transoms to be moved, multiplied by the weight of each panel/transom. I am afraid I cannot recall the exact figure; but it was quite staggering. He ended his note with this words; “Beware of the man they call the Pork Seller”. When Lta Soh heard of this note, can you guess what he did? He pinned it next to his desk and made all the new trainees read it! This picture always reminds me of a scene from the movie Ben Hur where Charlton Heston and his fellow slaves were chained to the galley ship. The only thing missing is the whip. By the way, more than ½ the guys here have at least a poly diploma in Engineering. Another interesting thing about Gillman Camp was it had a swimming pool - a considerable luxury those days, but you should remember that this was formerly a British army camp, and we know how those British military personnel loved to enjoy life, don't we? Although we were usually too busy or tired to go swimming, nevertheless we tried not to miss Thursday evenings. Do you know why? That was the day when they permitted the trainee dental nurses from across Alexandra Road to use our pool! While I was there the other day, I tried to locate the ‘syndicate rooms’ where we bunked for 4½ months. But unfortunately both the swimming pool and our syndicate rooms were gone. This reminds me of something interesting. At that time there was a campaign of some sort to save energy. So the camp commandant gave an order for the guards to come around our bunks to switch off the power after midnight or so. He reasoned that, once we were sound asleep, we didn’t need the electric fans anymore. Unfortunately, he did not take into account the kamikazes (mosquitoes). Although nobody contracted dengue fever, we did lose much needed rest thanks to Cpt Chan. We had no choice but to turn to mosquito coils. In my case, I didn’t even need mosquito coils. My roommate’s smelly socks could easily do the job (Sorry Chee Tiong, if you are reading this blog – your smelly socks are an indelible part of my memories of Gillman Camp). I am not one of those who like to make New Year resolutions. But for 2006, I plan to round up some of my course mates for lunch at the Gillman Village and savour the memories. And better do it fast too. I won’t be surprised if they convert the place to yet another condo. Or worse still; some of us may have to make an early exit. This is a picture of me (standing, 2nd from the right) with some of my course mates. Front row squatting from left: Dr Fwa, the soil expert. Next to him: my room mate and platoon mate in OCS, Ong Chee Tiong. 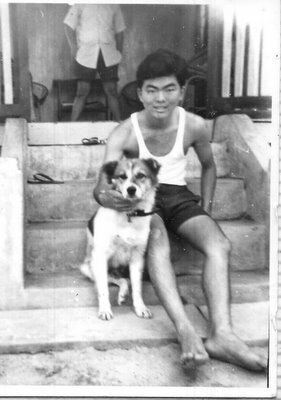 Back row with hand on my shoulder: another OCS platoon mate, Cheung Tuck. He has since left us more than 10 years ago. "The book of life is brief. The other day, there was a newspaper report about the enquiry into the drowning of a naval NS man. It was reported that when the victim was brought to the medical centre, there was no MO (medical officer) on duty because the centre had not been informed. I am not assuming any negligence or commenting about this particular case. But the incident reminds me of a couple of times when I was at the receiving end of negligence on the part of other officers – regulars, if I may add. So I hope that NS boys reading this post understand the importance of taking your NS duties seriously. Sometimes, if you “keng” or “twang” (basically it means to avoid work), it can result in serious consequences for others. Both incidents took place when I was platoon commander of a ‘pioneer platoon’ around 1977 or 78. The men in my platoon were being trained to become combat engineers. One evening, we were supposed to do some kind of demolition raid. It involved us walking along the railway track somewhere near the present Methodist Girls’ School area, if I remember correctly. By the way, we were supposed to blow up a bridge over the Pandan River. According to the exercise planner, there was not supposed to be any trains running that evening. Whilst we were walking along the track, horror of horrors, we suddenly heard the rumble of an approaching train. Immediately, of course we gave command for the men to move to the side, which was actually a narrow gap between the railway tracks and thick vegetation. As the train passed by, all kinds of horrible thoughts went through my head. On another occasion, we were supposed to do an amphibious raid. We took off on a few assault boats from near the Kranji River mouth and moved along the Straits of Johore to Sungei Gedong area. Along the way, we had to pass the Fibua (Fighting in Built-Up Area, for those who have not done NS) Village in Sarimbun. Again, according to the exercise planner, there was not supposed to be any live firing that night. But guess what? As we passed the area, we could hear the distinct rattle of M16s and GPMGs (you can easily tell the difference between the real thing and the sound of blanks), and before long, we saw tracers flying in the distance. I doubt any of the shots were aimed towards the sea, but still, you could feel your heart go cold. But strangely, the fear is more for your men than for yourself. I ordered my men to crouch low and prayed hard that my platoon sergeant and section commanders in the other boats had the common sense to do the same. Although both incidents took place nearly 3 decades ago, I think you can understand why they remain fresh in my memory. Thinking back, it does seem that the job of a demolition/engineer platoon commander is not easy. Every time there is a live demolition lesson, you have to remain behind (together with your NCOs of course) after the men shout, “Ignited!” and run for their lives, to ensure that all the circuits have really been properly ignited. Whenever there is a misfire, you have to be the one to go done down and check. Sometimes, my wife asks me why I should be the one to do it. My answer is, “If the commander doesn’t do it, who do you expect to do it?” Anyway, it is an unwritten rule. No wonder, some people like Chris are prompted to ask why our young men who have to take on such responsibilities are not even deemed mature enough to watch R21 movies. Last weekend I finally managed to compile the photos and video clips of my Ipoh/Cameron Highlands trip into a DVD for my relatives. 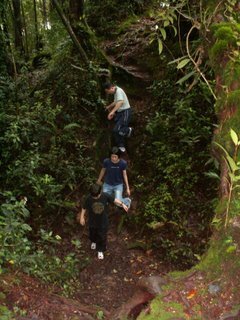 Viewing them again convinced me that going on such jungle treks and hill climbs are great for family bonding and building mutual care. Viewing the videos after the event is also great fun. I really recommend you to go for such a hike with your family. For a start you can go to Bt Timah Hill or MacRitchie Reservoir. Another place you can consider, which is quite near, is the Kota Tinggi Rain Forest Resort (cannot remember exact name) which we went to during the June holidays.